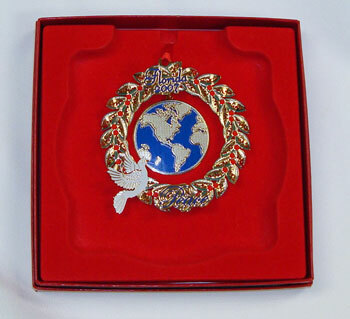 Florida 2007 White House Collection ornament, created by Tallahassee artist, Judy Miner, whose works of art have achieved acclaim internationally and throughout the U.S. This year's ornament, a traditional wreath enhanced by red holly berries, depicts the warmth of the season welcoming friends and neighbors into our homes, highlighted by a white dove, the global symbol of peace around the world reflecting the hope of all mankind for lasting world peace. Ms. Miner has created White House ornaments for the Florida tree for several years running.